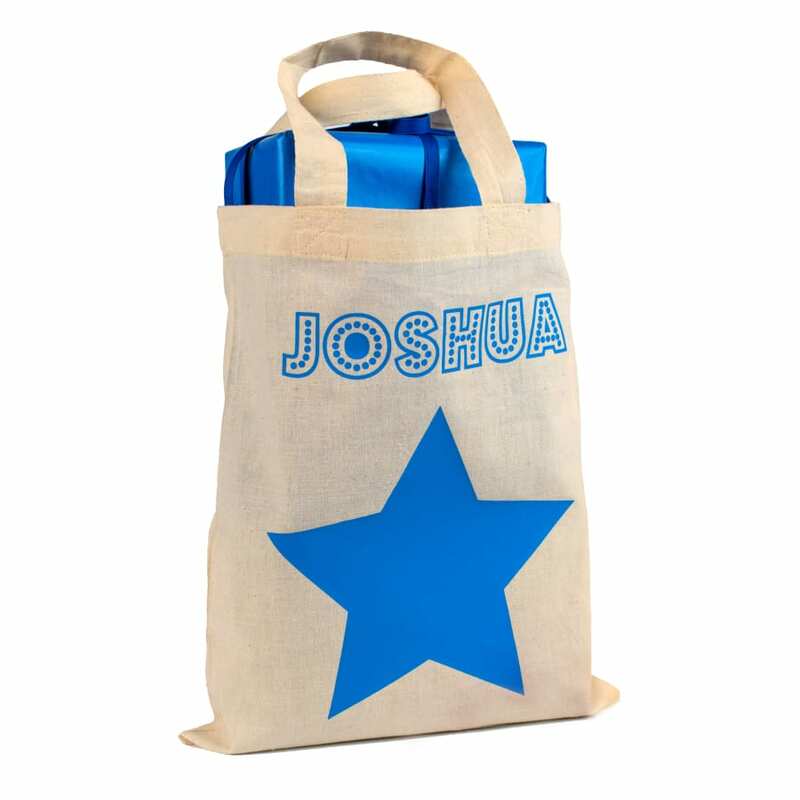 With a choice of bag colours and print colours you really can be sure that your star gift bag makes the perfect accessory for your gifts. 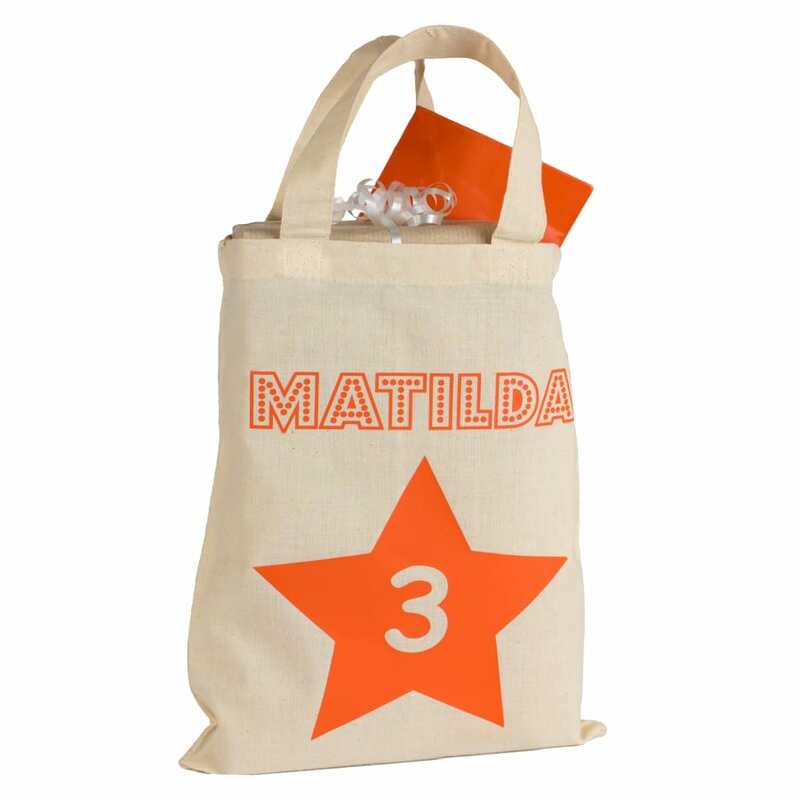 Your bag will be personalised with your chosen name, and you may even add the age of the person (this part is optional). Great for those special number birthdays for adults! Our star gift bag is suitable for children and adults of all ages. The bag is made from 100% natural cotton and comes in a choice of bag and print colours so each bag is individual. Please be aware that the natural colour may have tiny flecks. Design works best with just the Christian name. However if you wish, we can print both Christian name and Surname. This would appear over 2 lines. There is no maximum character restriction and we can even print accents. As the design is heat presssed on to the bag, please do not iron directly over the design. Bag is machine washable . As this product is personalised especially for you, it cannot be returned unless faulty or we have made an error. Please ensure you have chosen correct colours and entered the correct spelling. We endeavour to process orders as quickly as possible. In the bullet points at the top of page you will find the usual dispatch times for this product. You will be emailed if we expect a delay with your order. If you have ordered more than 1 type of product the product will the longest lead time will apply to your order. All orders are sent First Class Royal Mail for our UK Customers and Signed for International post for customer outside the UK. We post all UK orders first class mail using royal mail. Please allow 1 -3 from when you receive your dispatch confirmation email for the product to arrive. International Orders are sent via tracked post. You will be sent the tracking number for the items but we cannot give approx. delivery times as it varies country to country. We charge a flat rate post and packing charge, meaning you only pay 1 post and packing charge regardless of how many items are purchased in 1 transaction. The product with the highest post and packing charge for your order will apply.